Located at the head of Queen Charlotte Sound, Picton is the starting point into South Island of New Zealand. 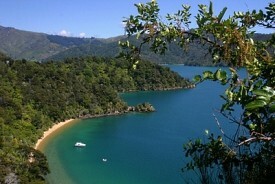 Picton makes an ideal base for an exploration of the Marlborough Sounds. A ferry service across the Cook Strait provides the connection to North Island. Excursions inland will take you into the heart of a major winegrowing region.